The only gingerbread house I've contributed to before was pretty much directed by my mother, when I was about 10 years old. She constructed an elaborate, two story structure and my brother, Mark, cousins John and Babe, and I decorated it with gum drops, Necco Wafers and other sugary things. 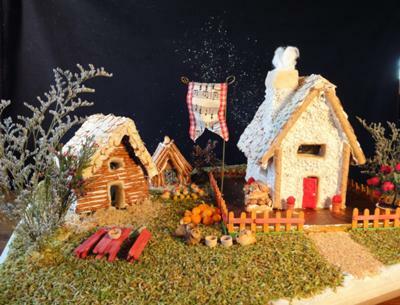 The Gingerbread Farm evolved from my mother's Gingerbread House recipe in my Honey Baby Darlin' series Book Two - Face the Music. It began as a recipe test, then became a photo shoot for the cover of the book. I thought about making a party out of it and inviting kids in to help. Then, I got my brains back and zeroed in alone, perfecting my little Farm - dreaming of tiny edible things with which to decorate it, and finding tools in my studio collection small enough to perform the tasks. I don't know which decorative element is my favorite - the marzipan chickens and pumpkins, the toasted and dyed coconut yard or the cotton (inedible) smoke in the chimney. The best thing I can say bout my Gingerbread Farm is that I would love to live there.